8.13 points at 15 votes (rank 59). "In an instant we were separated, the flash of light struck the tree. Our tree. She flew headlong a few hundred yards, landing on a flat stone. I tumbled into high grass. The shadow moved towards my beloved one and soon consumed her. Another flash appeared. This time the brightness blinded me totally but I could imagine the scene in front of me. I've heard the story so many times. Now it was finally happening. The curse was upon us. I swore I'd help her shed her serpentine skin and return her to her natural form, no matter what. I turned to the archmage and humbly asked to be able to wield a sword and wear armour. The price for his aid would be the very same item that I was now about to risk my life to obtain. The vessel of restoration. Iron clad and with death in my grip I ventured into the dark to find the goblet of gold." 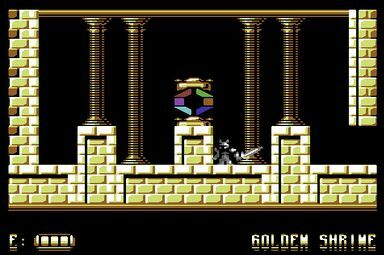 The game is a platformer with many action-adventure elements. The kinght meets different moving (as snakes, dragons, birds, water drops) and rigid enemies (as gargoyles) and obstacles (as spears or moving pillars), that can be fought and destroyed. Some enemies spit e.g fire. Destroyed enemies leave behind coins which can be collected. The enemies can harm the knight, which at first costs energy and then leads to death. If rooms that have already been visited, are reentered, the enemies also reapppear! Furthermore there is a map of the castle's labyrinth, which shows an overvire of the rooms that you have already visited. In the lower right of the screen the name of the currently entered room or area is displayed. The energy and coin display is at the lower left of the screen. The slideshow has been moved to a subpage. The level design as atmosphericly adapted to the topic of the game in dark multicolours. Room or areas are entered, which partially scroll horizontally or are blended in if needed. A correspondingly gloomy background music with sound effects round the game off. The game contains over 200 very nicely drawn screens, different extras and weapons, a lot of monsters and other enemies, five intermediate and one end boss, ingame music and sound effects, a laborious end sequence and you can even save your progress at some places. Look at every rune stone, as it holds either an important hint or a place to save your progress. The bonus ending is a reference to www.widepixelgames.com and a password to go on watching the bonus ending (preview to "Knight 'n' Grail 2") there. Unfortunately, the text field for the password is now missing on the website. 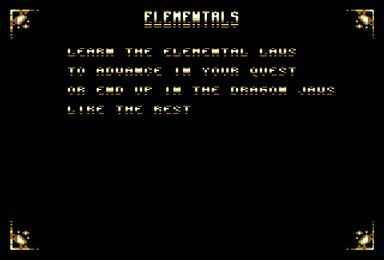 The version by "Onslaught" contains next to the manual on an extra disk also the following cheat options: unlimited energy, unlimited coins, all swords, all armour. Enter POKE 24496,173 with a cartridge and you get unlimited energy. Jodigi: "The demo or respectively the video on the producer's page look quite promising, the preview version plays rather well on the emulator and the game is addictive. A very good C64 game for a long time!" H.T.W: "A courageous knight, whose fair lady has been kidnapped and turned into dragon and who now has to go through thousands of perils to find the remedy, the magical goblet. 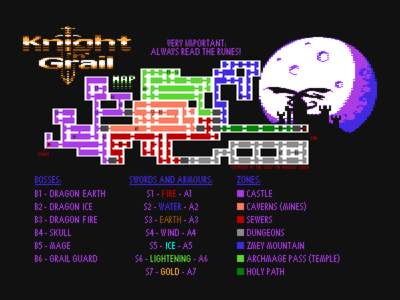 Somehow reminds me of Ghosts'n Goblins, but Knight ’n’ Grail is more an arcade adventure with huge levels full of action and puzzles in over 200 screens, where you find multiple weapons and armour, special power-ups, mean end bosses and puzzles. (The effect of the swords and armour somehow reminds of Koronis Rift - the effect of a swords depends on the sword colour and enemy colour, e.g. green sword has no effect against green enemy, the effect of the armour depends on the colours of the armour and the shots, e.g. red armour protects against red shots, etc.). The very nice graphics and the successful music and sound effects, the easy to learn and precise controls, the automap that can be viewed any time and the saving points for the progress increase the value of the game further. The difficulty grade is also not too high, with some practice you will play through Knight ’n’ Grail and may rejoice in one of the two superb end sequences (and will notice why it says "our tree" in the introduction!). Conclusion: A new, technically faultless, lovingly designed game for our old breadbox with a nice cover artwork that is definitely more than worth its price and can be put into the series of the best C64 games ever." Camailleon:"Brilliant, a great game from 2009! Excellent graphics, music that is not annoying, unobstrusive sound effects, fluent controls and scrolling. The story and the different armours, swords and extras are very imaginative, I like that :). There are diversified enemies in every part, handy saving points and the game is at no point too hard or unfair! You are at no time discouraged, I had always the feeling that it pays off to just try it once again. 10 points from me for a top game for a computer that still today deserves such a great game!" Stefan67: "Shooter without stress, jump & run without a fast death, atmospheric adventure added with fulfillment of the drive for gathering and exploring, and all that in one game. Graphics and sound are realised at best. The game atmosphere fits the background story continuously. A successful proof that excellent games are possible on the C64. Without doubt 10 points!"